Are you looking for a new epoxy garage floor? Professionally installed epoxy garage floors offer benefits like no other flooring systems, including aesthetics and lifespan. A well-installed garage epoxy floor is high-performing, durable, long-lasting, and resistant to most damages other floors can only dream of. Over the last ten years, epoxy has become popular in more than just industrial settings, it has truly made its way into the commercial and residential realm of flooring. Garages, both public and private, utilize epoxy flooring systems because they’re indestructible. In a garage environment, the biggest concern is impact/weight from vehicles cracking the concrete and/or stains from vehicle fluids, grease, or gas that will cause the floors to look older than they are. With epoxy flooring, all of those concerns are relieved and for low installation and long-term maintenance fees. An epoxy floor requires a professional installation when you are seeking the benefits: longevity, cost-effective, beauty, and more. A poorly installed epoxy garage floor can cost you a fortune including repairs, replacement, and even concrete damage. For an attractively long-lasting surface, call the professionals. 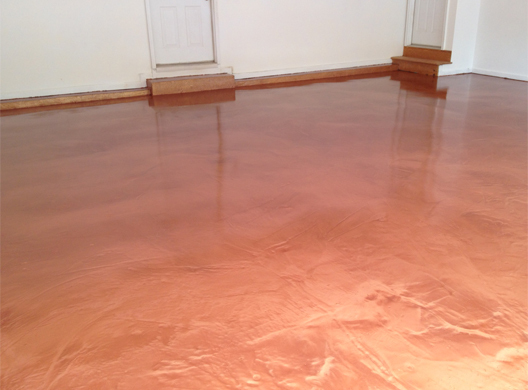 Epoxy floors can be installed to mimic other floors like tile, wood, or marble, but that sounds strange for a garage. Most people would assume that a standard dull grey or black epoxy is the best way to go, but those people haven’t seen a metallic epoxy garage floor. Metallic epoxy floors are true works of art that can never be duplicated, not even by the same contractor because the final product highly depends on the drying process no two floors can ever be identical. Every installation creates a different 3D illusion with swirls, designs, colors, and more. Metallic epoxy floors are also the strong epoxy choice around, meaning, metallic garage epoxy floors are made of 100% epoxy and do not damage, chip, or crack under heavy use or pressure. They are slip-resistant and accentuate your garage in the process. Garage metallic floors offer people who thought a utilitarian design was the only option for their garage floors new ways to see their garage floors. Grease, grime, and car fluids are a thing of the past. Garage metallic epoxy floors are not delicate nor are they easily damaged, these floors resist any chemical break down and keep all grime, oils, debris, and fluids on the surface, making your floors easy to clean. Why do you need a professional when there are DIY kits being offered everywhere? Installing an epoxy floor in your garage requires equipment that can help contractors determine things like the strength of your concrete, leftover coatings or paints, damages that need replacement, temperature, moisture transmission, and so much more. All of those elements interfere with a proper epoxy garage floor installation. A professional garage epoxy installer will first inspect your garage floor to ensure there aren’t any surface or foundational cracks, abrasions, scratches, or leftover coatings/paints. Prior to installation all of these issues must be properly taken care of for an epoxy mixture of resin and hardener to cure with your concrete. Next, an installer will prep your surface and the epoxy chemicals will lie over your concrete floor, the drying process varies with each garage depending on size and temperature. If there is too much moisture or the epoxy coating has not been installed properly things like bubbling and peeling will begin to occur almost immediately. It is important and in your best interest to hire a professional for your epoxy garage installation. 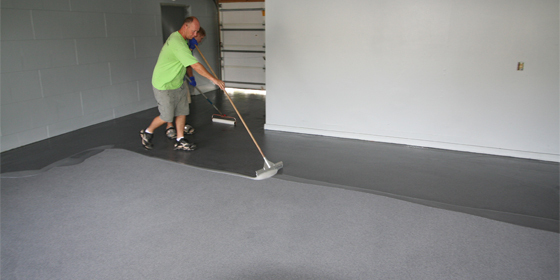 Another option for your epoxy garage floor is the flake epoxy installation. This is a beautiful and highly sought-after choice among garage owners because of the many benefits it offers. A flake epoxy garage floor offers an array of color options that can make your floors look beautifully unique and quite inviting. A flake garage epoxy floor creates a beautifully patterned area that is seamless, colorful, and brightening. These floors can help a garage go from dull and dark to bright and elegant. During an installation, issues like cracks and hole are filled and fixed; however, aesthetic issues are not always easily gotten rid of, but flake epoxy flooring makes those issues look like they never existed. Imperfections are incredibly well hidden with flake epoxy garage floors. 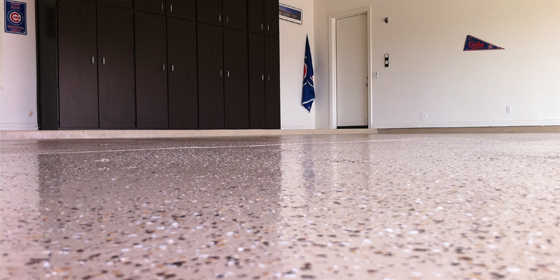 Flake epoxy can be installed in garages that aren’t completely closed and are also slip-resistant. WHAT ARE EPOXY BENEFITS AND WHAT DO THEY MEAN? An epoxy floor offers garage owners a seamless surface that is impact resistant, meaning, it will not crack or chip easily. Heavy machinery and vehicles can be stored in your garage space without fear of any breakage occurring. Epoxy floors offer unlimited amounts of aesthetic benefits that will best suit your individual wants and needs. Concrete alone is a very porous surface that is easily damaged if it is not coated and protected properly. An epoxy garage floor cures above and inside the concrete’s pores blocking moisture transmission from the top and the bottom of the actual concrete slab. If water or moisture were to penetrate a concrete floors surface and sit within its pores, it would create a breeding ground for mold, mildew, and bacteria that would have a strong potential of spreading to the rest of your home. Epoxy technology allows these floors to resist chemical breakdown, create a safer environment, strengthen concrete, and are better choices for garages, stores, homes, facilities, and more. 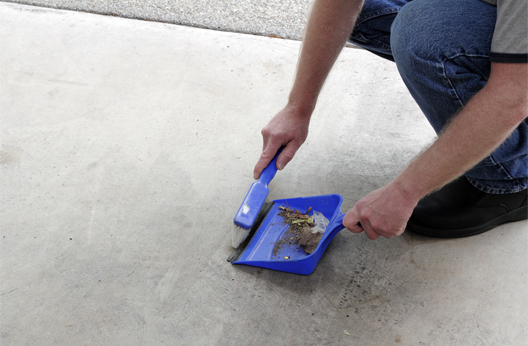 Durability: Epoxy garage floors do not break down from chemicals or car fluids. Maintenance: Your garage floor has never been so easily maintained. An epoxy garage floor does not require back-breaking maintenance or bank-breaking maintenance. Brightness: An epoxy floor brightens a poorly lit garage by reflecting light off of its glass life appearance. Low-cost: An epoxy floor does not require extra materials for installation, and it does not require constant repairs and maintenance, thus, reducing its overall cost not only immediately but long-term. HOW SHOULD YOU MAINTAIN AN EPOXY FLOOR? An epoxy floor is easily and cost-effectively maintained. Your garage floor will require much less attention than you’re accustomed to and it will not damage because of it. Even with our recommendations, it is important to consult with your epoxy floor installer about your floor’s maintenance. We suggest daily sweeps and weekly light mopping with cleaners that do not contain soap. Leaving soap on your epoxy floors surface will damage its coating and reduce its shine. An epoxy floor should also never be scrubbed or mopped with acidic cleaners that could eat away at your floors coating. If you have specific questions or concerns about maintenance, give our professionals a call today. We pride ourselves on providing the best customer services and quality of work that Dallas has to offer in the world of epoxy.